Supported by heavy-duty frame, SWEPFF SeriesÂ is specifically designed to meet needs of fuel delivery, fire, and airport truck operators. 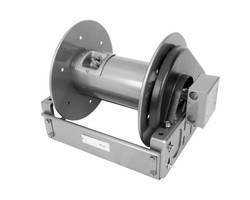 Reels mount inside truck cabinets and pull out and forward, moving away from truck for accessibility. 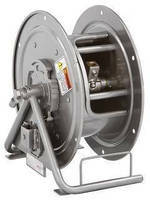 Two pin-locks are used to lock reel in place for forward hose deployment and for storage.Â Constructed with stainless steel internal plumbing, reels have explosion proof motor and aux bevel gear rewind with pinion brake. 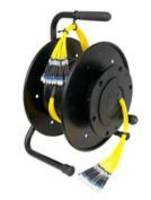 Hannay Reels recently released the SWEPFF Series swing out single or dual agent hose reel specifically designed to meet the unique needs of fuel delivery, fire, and airport truck operators. The reel is built to mount inside truck cabinets and pull out and forward, moving away from the truck for greater accessibility and ease of operation. 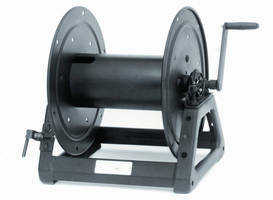 Supported by a heavy-duty frame to hold its weight when out of the compartment, this new model is equipped with two pin-locks to lock the reel in place for forward hose deployment and to it return for storage. 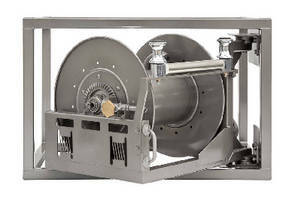 The SWEPFF Series is constructed with stainless steel internal plumbing, an explosion proof-motor and an aux bevel gear rewind with a pinion brake. Custom sizes and configurations are available depending on cabinet size, including left- and right-hand setups.